I’ve teamed up with Alexian to bring you this delicious post! I recently had the opportunity to try some amazing products from ALEXIAN. Let me tell you a little about them. Alexian is America’s premier producer of the finest pâtés and mousses all made with the finest, freshest all-natural ingredients and without any preservatives, additives, hormones, antibiotics or fillers. Alexian’s founder, Ewald Groezinger, was originally from my hometown of Stuttgart, Germany where his family, since the 16th century, specialized in making the finest meat products. He started Alexian in the U.S., named after his two children Alexandra and Ian, and after his passing his wife, Laurie Groezinger Cummins, continued the business as a Certified Woman Owned Business Enterprise. The family tradition of excellence continues to this day in every aspect of Alexian’s operation and they celebrated their 30th anniversary three years ago. I moved to the U.S. eleven years ago and have never been able to find the quality pâtés and mousses that I enjoyed in Europe. So I was thrilled when I came across Alexian. Sampling their products was like being back in a café in Paris or on a French countryside picnic with friends. And I’ll tell you, Alexian’s Duck Rillette is seriously one of the best things I’ve ever tasted! In a word, Alexian’s products are superb in every way. So much so that I wanted to do something special to share them with you. I have invited a friend of mine from France to showcase them. Today she’ll be featuring Alexian’s Duck Rillette and Pheasant Rosemary Pâté as she introduces you to “country style” French entertaining. And stay tuned, because there will be a part II to this French entertaining series! 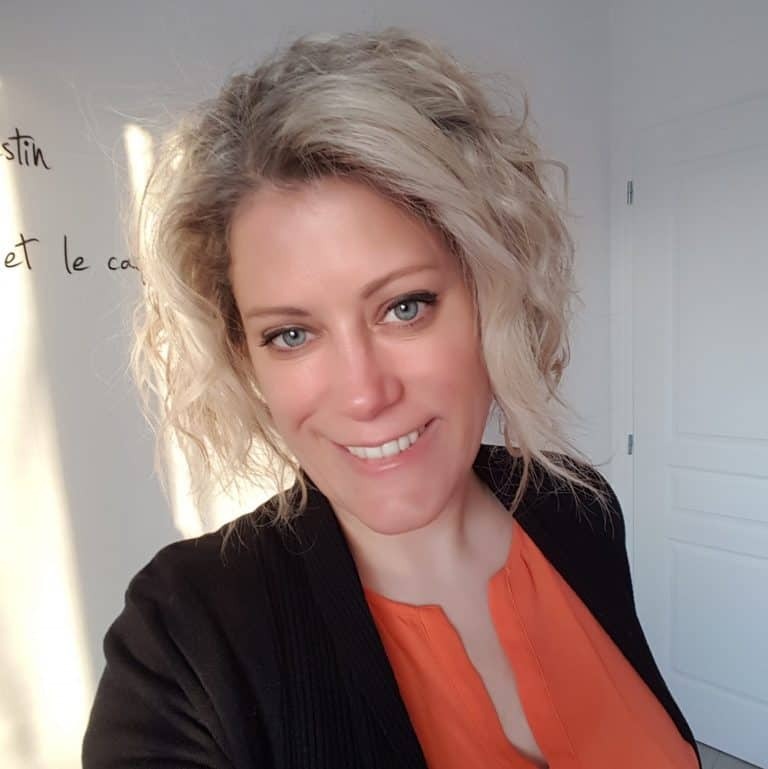 Joining us today is my super talented French friend, Sandrine Vannson, who is going to tell us a little about French entertaining. Originally from The Vosges region of France, Sandrine went to school to pursue a career in fashion design. She left college with her degree only to go back to school to complete a second degree in teaching. She now lives an hour southeast of Paris teaching high school English. Sandrine comes from a family of accomplished cooks and restaurateurs and is herself a phenomenal French cook. Sandrine spent a couple of weeks with us last month. We did some sightseeing of areas she’s never visited and, of course, did some cooking. She was here just in time for the arrival of my goodies from Alexian. We are fortunate to have her with us today to share her talents with us tell us a little about French entertaining. Kimberly: Tell us a little about your background in cooking and the different influences you’ve had. Sandrine: As far as I can remember, I have always been in a kitchen. It was and still is the most important room at home. I have always seen my mother and grandmothers cook and enjoy what they were doing. I grew up in the northeastern part of France, in the Vosges area, not far from Epinal, and that area as well Lorraine and Alsace largely influenced my grandmothers. 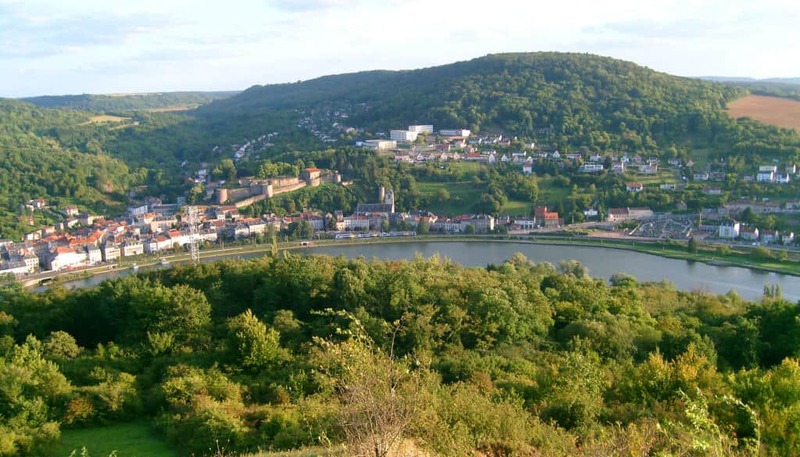 On my paternal side, the family didn’t move a lot for centuries, simply going down the Moselle river from the mountains to the valley. The cooking there is very countryside with lots of bacon, meat, cheese and potatoes. It’s a simple style of cooking yet so rich and tasty. My childhood is filled with memories of this homemade cooking. During the spring and summer we would spend our Saturday’s at my grandfather’s where had a large pond. We would have a barbecue and then we would go fishing or relaxing in the clearing with nothing but nature to listen to. We would also go mushroom and blueberry picking. Then we would take everything back to my grandparent’s house and have girolle mushroom omelets followed by trout with slivered almonds and blueberries fritters for dessert. Yummy! On my maternal side we had another tradition. We would make couscous every time we gathered as a family. Having been married to a soldier, my grandma learned how to cook different dishes from the places where they would have been sent with the army. So when they went to Djibouti she learned how to make the couscous and that’s how the tradition started. I guess I developed my adventurous side in cooking with my mom, an incredible cook, my sister, her husband (who has Italian roots) and some of my closest friends. Most of my friends’ parents (one or both) came from different countries so I was lucky to have some great teachers to introduce me to new flavors and new cooking styles and techniques. I also had the incredible chance to live in the USA for a year and a half. While there my roommates, who were mostly foreigners like me, were a source of inspiration. Asian, American, Mongolian, Tahitian, Mexican and so on. A real goldmine. Since then, I’ve been eager to find and try new things. Give me a new cookbook or the opportunity to meet other passionate cooks and it’s like Christmas to me! Kimberly: I understand two of your grandmothers owned their own cafes in France? Sandrine: Right. My mom’s great grandmother had a café- restaurant first in Nancy, Lorraine, and then sold it to open a new café in Haroué next to the castle. Her son, my mom’s grandfather, was also a cook and worked in Paris for a little while before going back to Lorraine. He never stopped cooking and transmitted this passion to his son (my grandfather), my mom and several of her brothers and sisters, down to us, his great-grandchildren. One of my cousins also opened a restaurant. My great grandmother on my dad’s side owned a café as well. I remember playing with the little wine glasses she used to serve liquor. My sister and I would pretend that we were running a restaurant. We had so much fun. Kimberly: What do you enjoy cooking or baking the most? What would you consider your specialties? Sandrine: I really like cooking different kind of things. Asian, Italian, Mexican and French (of course) are my favorite of all. I prefer cooking the savory dishes but I have to admit that a good lemon meringue pie always wins my heart! My family would always go for my caramelized pork or if it’s during Christmas, they would ask for my mango upside-down tart with foie-gras. Kimberly: You’ve traveled extensively, sampling cuisines across the world. What do you see as some of the core differences between French and other cuisines? Sandrine: The length of the meals! We, French people, love to eat and we could spend hours sitting at the table and go through appetizers, starters, main dish, cheese/salad and dessert. Some even push it to the coffee with mini-cakes. Another difference is the size of the different courses. French cuisine is known to be sophisticated. So you usually have quality in products and presentation over quantity. We probably would define it as an art! I believe that French cuisine has different faces: It can either be traditional, gastronomic, or nouvelle cuisine. It’s also versatile because each region has its own specialty and way of cooking. Kimberly: Today you’ll be demonstrating some traditional French ways of entertaining, specifically how to serve pâté and rillette. Here in the U.S. these items are considered more upscale and, unfortunately, they are something many Americans have never even tried. 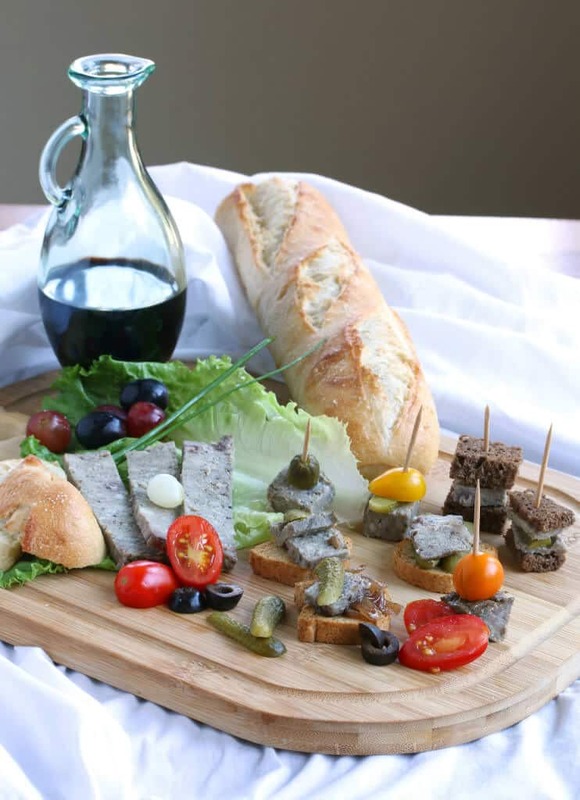 What role do pâté and rillette play in French entertaining today? Sandrine: They are basics. They are something that you will find in any countryside aperitif or buffet-dinner or just simply anytime you feel like it! 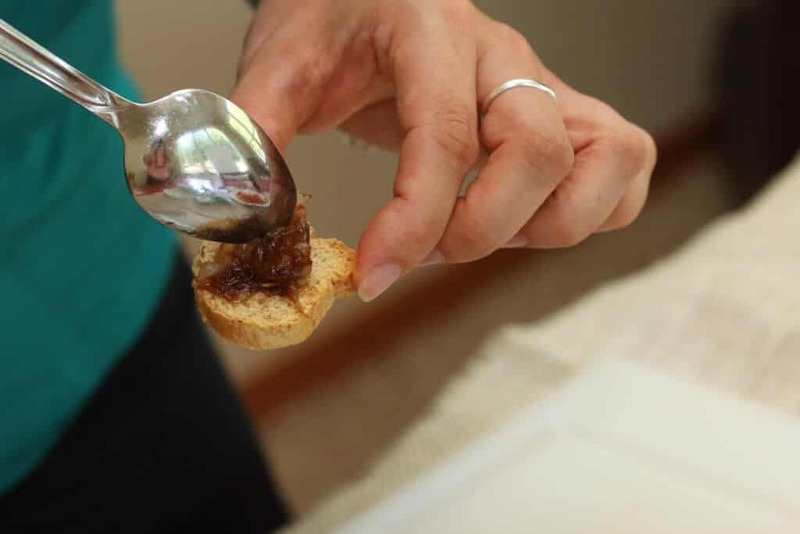 Kimberly: With that introduction we’re now going to turn the time over to Sandrine to show us some fun, traditional French ways with pâté and rillette as well as her famous Maple Caramelized Onions! Sandrine will take it from here…. 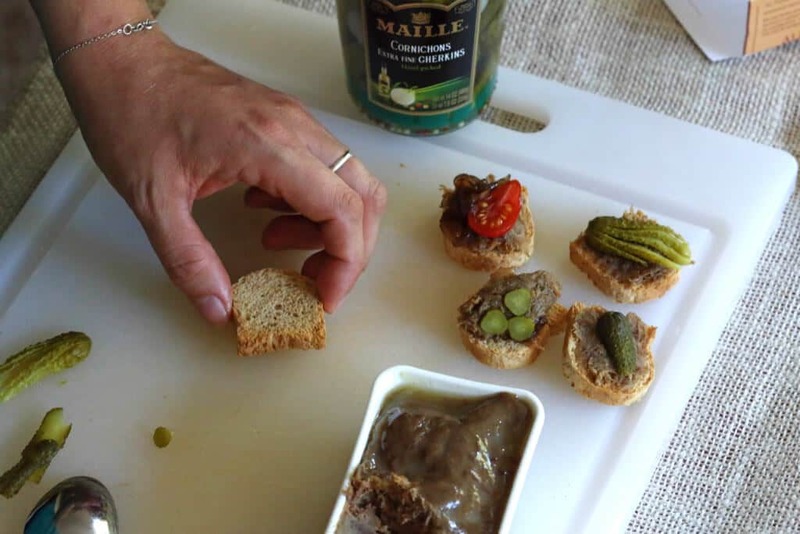 Rillettes and pâté are very common in France. Rillettes have been around since the 15th century in the Indre et Loire region, not too far from where I live now. For centuries it was considered a treat. Later it was popularized in a city called “Le Mans” in Sarthe, a neighboring region. Since then rillettes can be found anywhere and are especially appreciated in country style buffets or as appetizers. It’s perfect for picnics and eaten in sandwiches. You just spread it on fresh crispy bread and add some pickled gherkins. Rillettes are so tasty that they have been created with a variety of meats. You can find rillettes made out of pork, duck, goose, roasted chicken, rabbit, game or even salmon, tuna or trout. 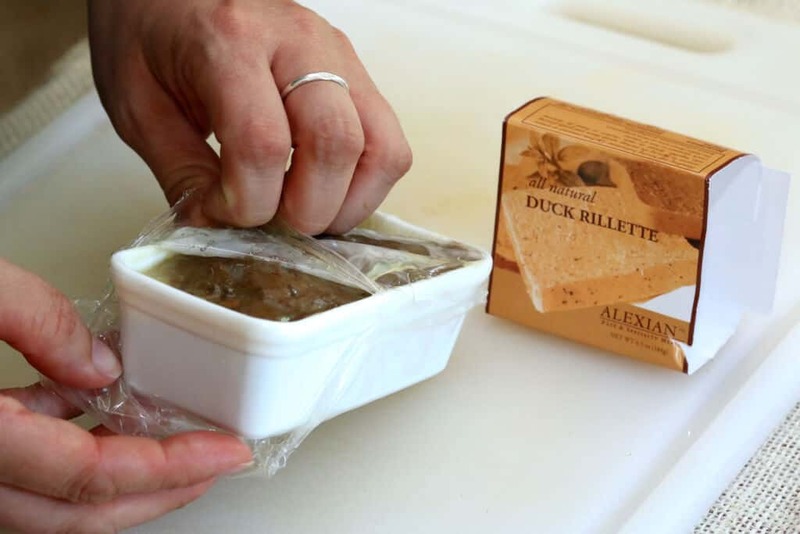 Alexian’s duck rillete is one of the best I have tasted, and I have tried many. 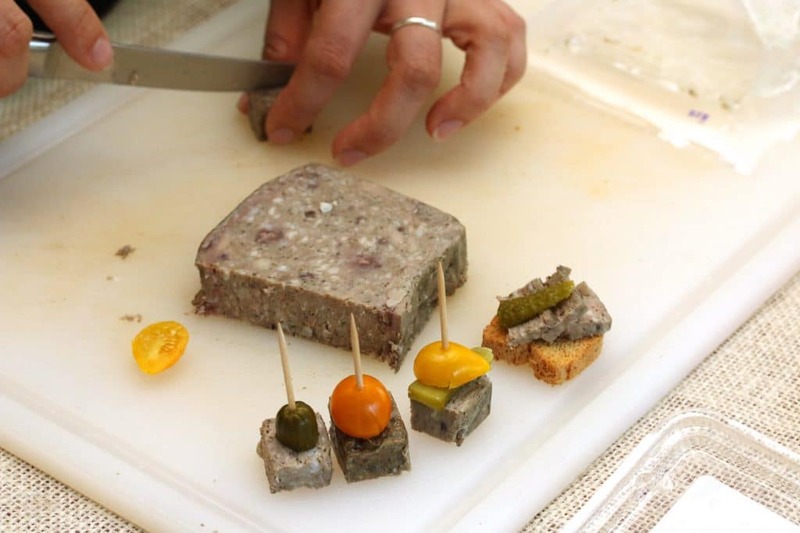 Pâté ( or “terrine” as we could also call it) is another great alternative for a more rustic type of entertainment. It can either be made with meat, fish or vegetables. You always want to associate it with good crispy, flavorful bread. The Alexian products we will be working with are just perfect for this kind of rustic “country style” entertaining. Hopefully, I’ll tempt you with this little overview of what France looks and tastes like . There is an association that I really like with duck: “le confit d’oignons” (glazed onions). I have my own interpretation of it and it will be perfect for our preparations today. So let’s start with the Maple Caramelized Onions. To make the caramelized onions, take as many onions as you want depending on how many caramelized onions you need. Peel them and slice them thinly. Melt some butter in a frying pan and add some olive oil so the butter doesn’t burn. When the onions are translucent add some balsamic vinegar so it will color the onions and adds this nice acidity touch. Add some sugar (I would say a small tablespoon of sugar per onion). Stir together and then add some maple syrup (a tablespoon per onion or a little more if you like it a little sweeter, but not too much or it will be too sweet) and keep stirring. Let it caramelize until the onions are glazed. Now let’s prepare the rillettes…. Originally, rillettes were only made with pork. People used to give cooked pork morsels to their neighbors as a treat. Rillettes were at first a process to preserve pork meat, that’s why you have a layer of fat on top of it. Today, we want to shape our rillettes to be able to make some nice looking “canapé”. In order to scoop and shape them the rillette will need to sit at room temperature for a little while. 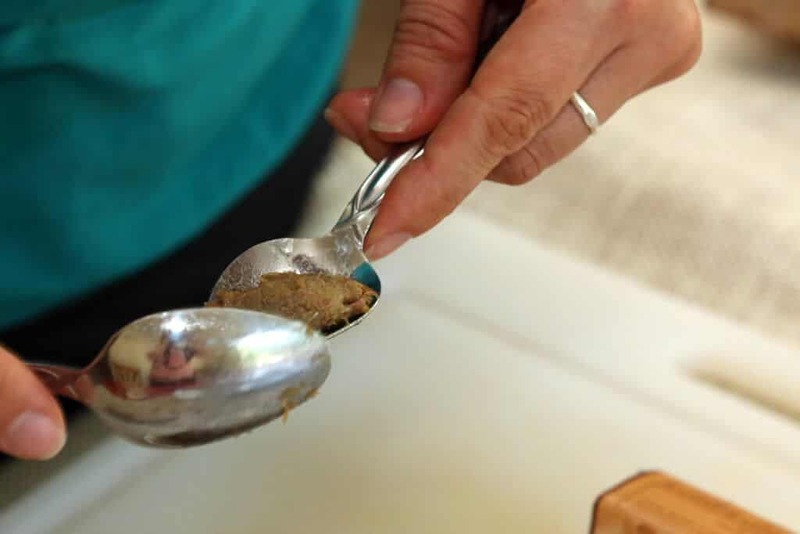 To make a nice-looking “quenelle”, I will use 2 spoons to work the rillettes. We’re going to place some of the onions and rillette on some crispy toasts. 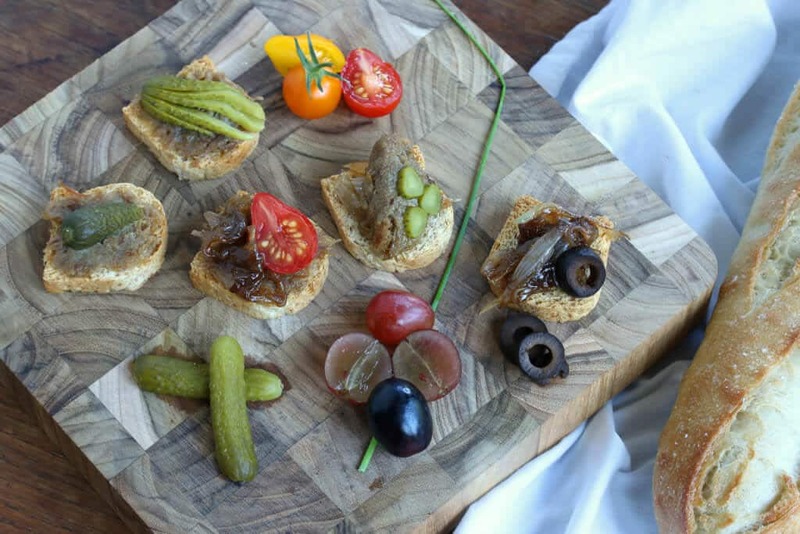 You can make your own crostini from fresh French baguettes or you can use these French-imported Mini Toasts from Divina. The latter is what we are using today. Just before dropping the rillettes quenelle onto the toasts, add some of the maple caramelized onions. 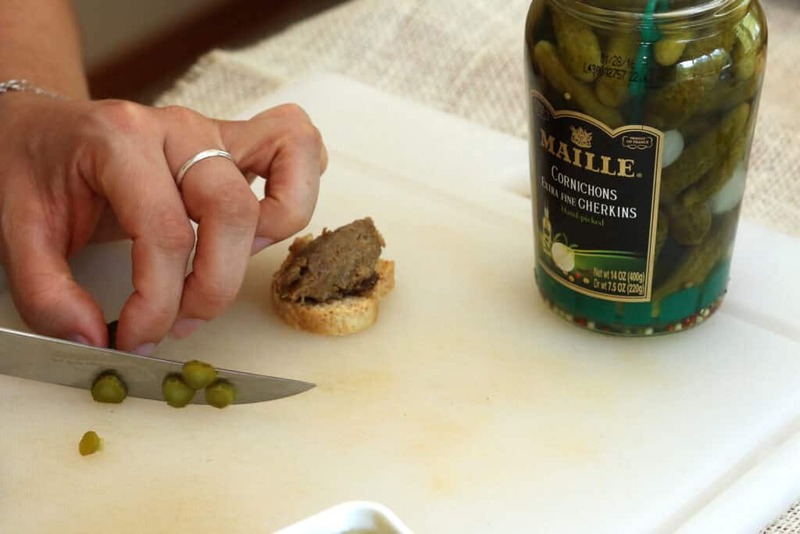 Don’t forget to slice some pickled gherkins and add them on top of the rillettes. Rillettes and gherkins just belong together. We can’t think of eating rillettes without them! 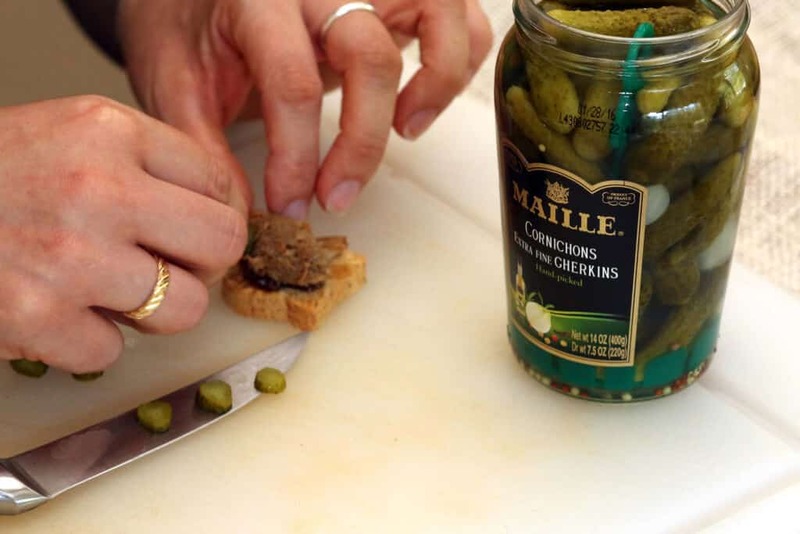 I’m using Maille Cornichons from France and highly recommend them. That’s what we use in France and they are the best. You can slice the gherkins as you please. There are no rules. Just be creative and enjoy what you’re doing. The sky is your limit. You can also pair these toasts with cherry tomatoes or any fresh vegetables you like. Here again, we have this picnic idea somewhere in the back of our minds. Either refined or rustic. You choose the atmosphere. Sandwiches would look more rustic while this kind of presentation is a little more sophisticated. When your “canapés” are all done, arrange them on platter (a wood platter would be consistent with the countryside entertaining theme), and add some fresh veggies for decoration. You can also add some grapes which will strengthen the idea of rusticity. Beautiful to the sight and so tasty. Next we’re going to work with the Pheasant Rosemary Pâté. 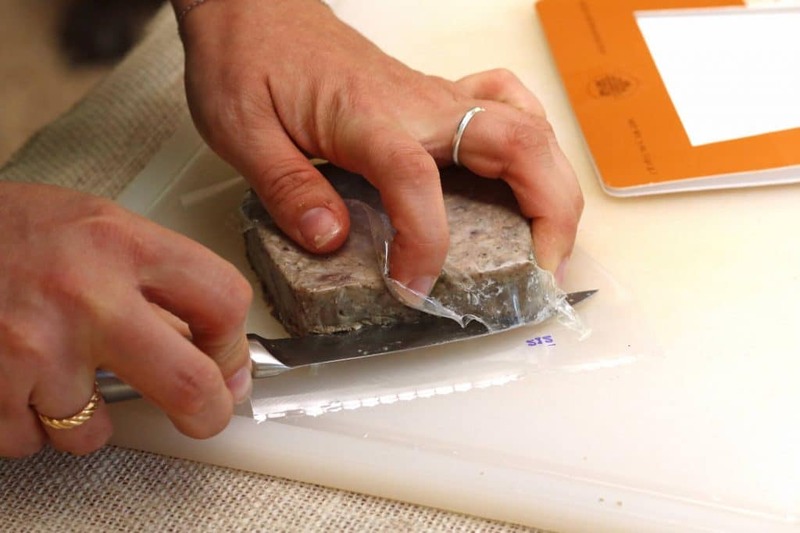 Unlike the duck rillette, the texture is not as malleable so the best ways to present it is to cut into squares and jab it with a toothpick. You can either add fresh tomatoes or gherkins or both. 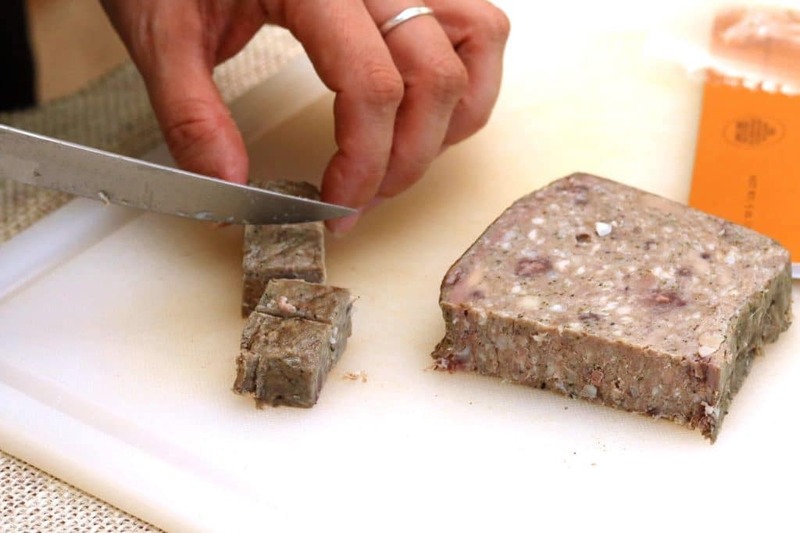 Or you can just slice the pâté and put it on a slice of fresh crusty bread or on toasted bread. You can also make mini sandwiches held by a toothpick. These are just a few ideas of how you can present it. 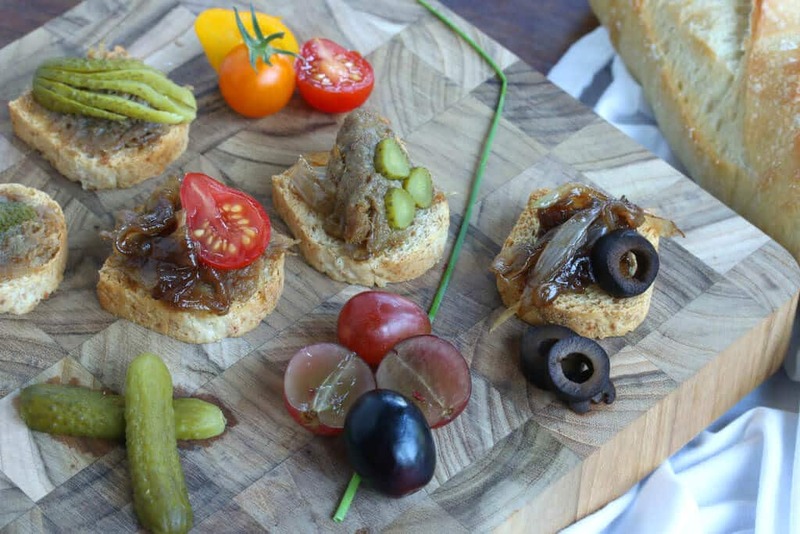 As with the duck rillette canapés, arrange these on a wooden platter for a more rustic look and garnish with fresh veggies, including lettuce leaves, and grapes. 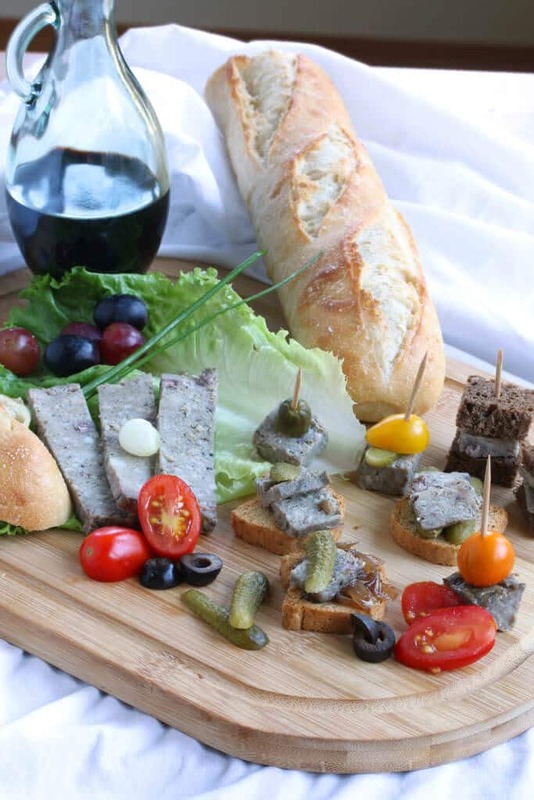 We hope you’ve learned a bit about French entertaining and have been inspired to try some rillette and pate at home! Be sure to join us for Part II when I discuss French entertaining the contemporary way! 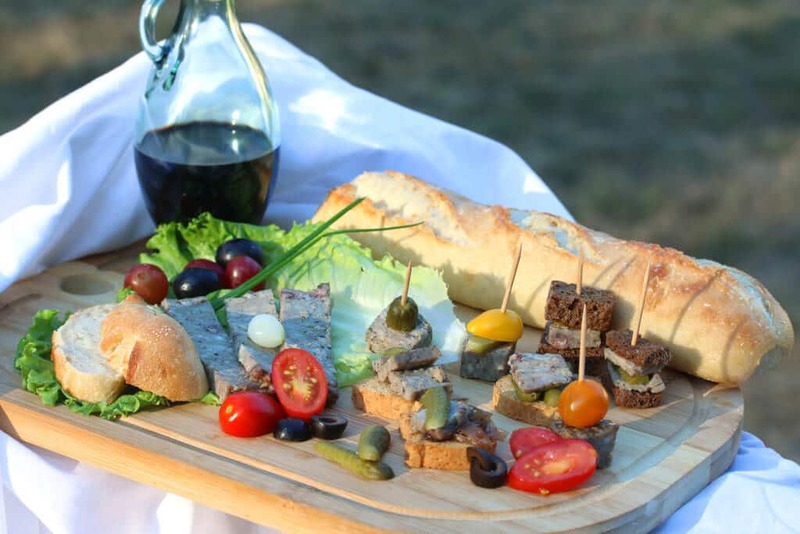 One lucky, randomly chosen winner will receive this entire French-themed gourmet package, including a combination of 6 different pates/rillettes/mousses from Alexian! One winner will be randomly chosen and notified via email. If the winner does not respond within 48 hours another winner will be chosen. This giveaway is open to U.S. residents only. These Maple Caramelized Onions from Sandrine Vannson are simply delightful and are the perfect accompaniment for your French entertaining. To make the caramelized onions, take as many onions as you want depending on how many caramelized onions you need. Peel them and slice them thinly. Melt some butter in a frying pan and add some olive oil so the butter doesn't burn. Add the onions. When the onions are translucent add some balsamic vinegar so it will color the onions and adds this nice acidity touch. Add some sugar (about a tablespoon of sugar per onion). Stir together and then add some maple syrup (a tablespoon per onion or a little more if you like it a little sweeter) and keep stirring. Let it caramelize until the onions are glazed and have a rich and thickened consistency. I’d like to try the Alexian products because we’re always open to trying something new. I can envision taking that prize package on a picnic, or setting up the toasts, pate and some other items on the tray and taking them (and some wine!) out to the back patio to enjoy with friends. Although it’s starting getting a tad chilly out now in the evenings. I would love to try because I have never had it and always wanted to try it out. I would love to serve it at my sons engagement he is about to pop the question! I LOVED this!! 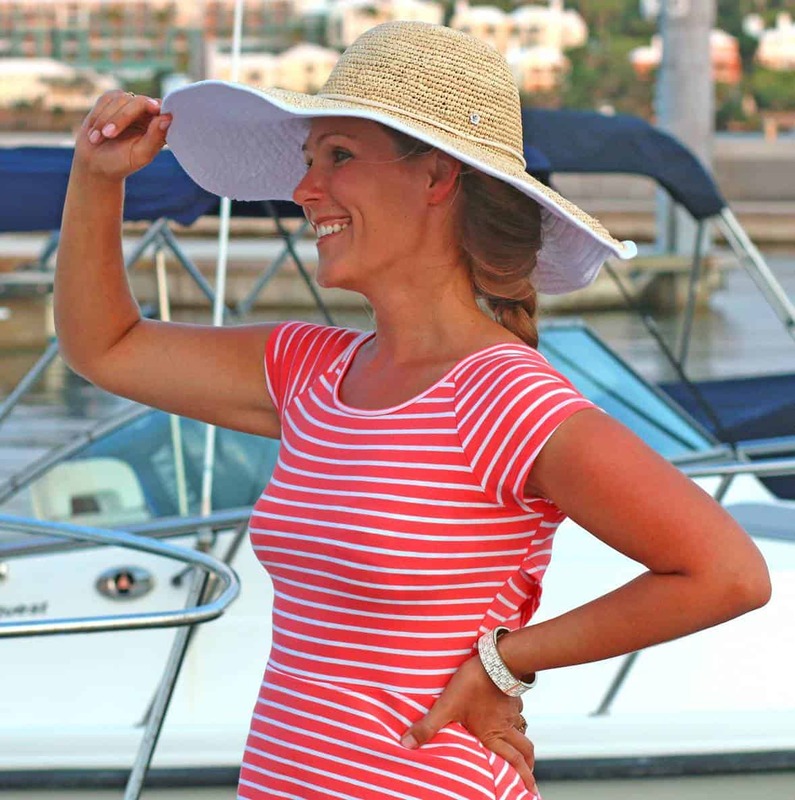 Really enjoyed reading about Sandrine’s experiences and it was fun to “see” her at work. Talented indeed, the food displays all look stunning! Thanks for taking the time to teach us about French entertaining and I’m already looking forward to part two! I would love to have these to serve appetizers on for our family holiday gathering. This was so much fun! Thank you, Sandrine, for sharing your talents and expertise with us! I visited Paris years ago and have loved French food ever since. I’ve never tried anything like this before and this post has inspired me to begin! 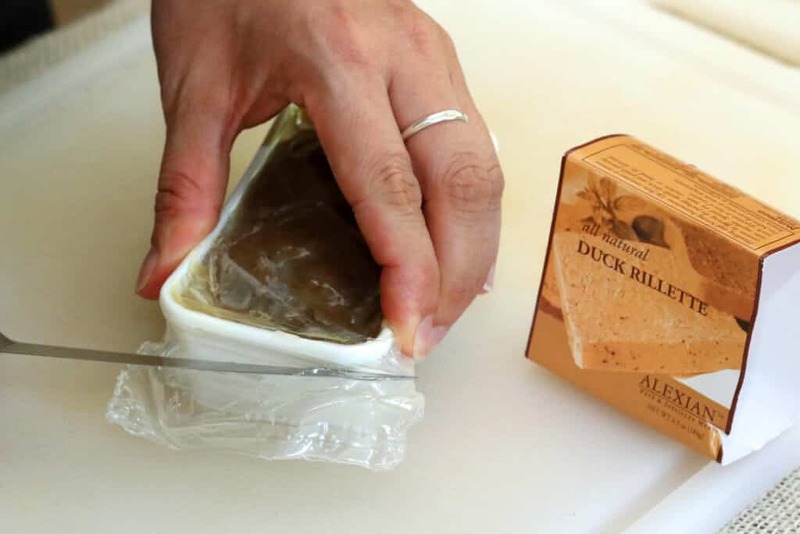 I would love to try Alexian’s duck rillette and pate and prepare a nice and cozy evening of entertainment at home with dear friends. I find appetizers stressful, so I have always had a cheese, salami and olive tray. I think this would be the perfect addition to that! I grew up with a mom who adores paté but having said that I have only tried a few and would love to try more. I am dying to dry the duck rillette based on your description! Perfect food for an informal lunch or supper with lovely French wine, of course. Since I have never experienced pates / rillettes / mousses, I would like to start with the best. Our family gathers for the holidays, and my son-in-law is as interested in food as I am. I know the two of us would enjoy this new adventure, and we would influence the rest of the family to share the journey. I had some of the best food in France. You are so right it is so hard to find a delicious Pate here. This one looks divine. These are some sophisticated but delicious sounding appetizers! I wish I could enter the giveaway but I am sure someone will be really happy with that prize! I would love to try my hand with these especially using authentic ingredients. I’ve 2 DISABLED VETERANS (son & daughter nurses USN & USAF) & I try to surprise them with new ideas to keep them motivated. This would be great as we lived in France for 4 years & all loved the entire experience. My 2 have never lost their love for French food–a 4 yr. asking for “foie-gras pate please”, was enduring! Mmes Sandrine , you have put this over the top with your lovely descriptions. The tote would be so useful for hospital trips (VA) as our totes are continually misplaced. Thank you ever so much for the chance to win. Wow, what an amazing presentation! Honestly, I have little experience with pates, and for that reason would love to try them. I think I would invite our neighbors over – they are just across the hall, yet we still haven’t had them over! They love wine and appetizer nights, so I know they would love this. I’d love to try them since I always think of pate as something I can only get at fancy restaurants! I’d have a few good friends over and have a wine tasting party to complement! I would love to use this for entertaining at Christmas time! I usually have a lot of people over – big family on my husband’s side :) Thanks for the amazing giveaway and loved reading your post! So many things to say here! First of all the pictures of France are beautiful and reading Sandrine’s contribution was great! Second, I LOVE these products and would buy them for client parties all the time. Third I love your maple onions! And finally fourth, heck yes that giveaway is amazing! Thanks! What a beautiful arrangement! I need to serve something like that for our next party! The French just do everything better! What a great way to entertain, everything looks so good! What a beautiful set up. I’d love to serve this at my next get together. What a beautiful presentation. I’m not familiar with Alexian products but thank you so much for introducing them to us. It speaks volumes when you say you haven’t been able to find something similar to what you enjoyed back home until now. i love having small gatherings with small plates! I would love all of these prizes! I’ve never tried anything like this, but it does look like the perfect appetizer or picnic food! Would love to try! I’ve never been to France…yet, but hope to get there some day. Until then, I appreciate a lesson on French entertaining. It’s so rustic and beautiful! What a great post. I really enjoyed reading it and love the presentation! Thanks for sharing. I’d love to entertain like that! Yum! Also, let me just tell you that I love gherkins haha I just had to throw that in there! Love to go on a picnic with these goodies. Love all the ideas here! But those Maple Caramelized Onions are calling to me!!! They look AMAZING! What a wonderful and informative post! I find french cooking (and entertaining) a little intimidating. Thanks for breaking it down for us with these wonderful appetizers! How cool that today’s post has a connection to Stuttgart! And I can’t get over how long this post must have taken you to put together. Wow! Loved the interview and those onions sound incredible. I would love to serve these goodies to my Mah Jongg friends. What a fantastic article. I agree with Sandrine it is a challenge to find quality European pâtés, mousse and terrines here. And, we Americans eat so fast and large. Lol. And these two reasons are a few reasons I would love to win. I love entertaining and having quality foods for my guests..a fave way is having an apps cheese board with district country artisan breads and crackers. These products would be a perfect pairing. And, perfect for my holiday open house. Or, for a romantic impromptu picnic with my honey t the beach..long and leisurely. these all look amazing! simple and inspired ingredients really do make the perfect appetizers! I love the presentation of this. the appetizers are amazing with great ingredients etc, but the look of it all… they say you eat with your eyes, and before even trying these, they look simply amazing and quite appetizing! I agree that pate is something that is more unusual in America than in Europe. Finding prepared pate that is actually edible can be a difficult proposition. I love how easy you make entertaining with Alexian and Sandrine. Those maple caramelized onions are calling my name! I just found you when I did a search for peanut butter cake, which I’m sure my grandson will love for his birthday next month! I’m looking forward to perusing your site! Love the bloggers! You girls have changed my life! For the better! These products are outside the norm for me but I love trying new foods. They’d be perfect for my birthday get together. That is my idea of a perfect dinner! No joke, I could eat like this al of the time. I love pates and cheese plates and bread. This looks amazing. I’m currently taking care of my elderly Dad full time, so I would use these for a “at home” picnic with my honey. Really nicely written post – I don’t think I’ve ever had the pleasure of tasting a pate. Nice hostess set up and may have to try this and serve for holidays! I love pate! French nibbles are the best. What a great assortment of products. Love the simplicity and diversity of flavors in these! I love trying new foods, and I haven’t sampled many pates yet. They sound fantastic, and perfect for a holiday party! I was born in France and LOVE this food! It’s been years since I had pate and it was with friends in France. It was great stuff and I’d really enjoy having it again for an informal get-together, especially the rillette based on your opinion of it. Great post! Would love to try these products because they look good and we love trying new things. Also they would be great to have for any holiday or even a daily dinner. I love having parties and there are a few coming up – birthdays, Thanksgiving dinner, Christmas and New Year’s Eve. I’d love to use these Alexian products for my next holiday party. They’d make simple but impressively flavored hors d’oeuvres! Honestly, I’d love to have them for a special night in with my husband! I’d love to celebrate my brother’s birthday with these pates, I think he’d love them! My sister is coming home with her new adopted baby. I would love to make her a special celebration dinner. I would love to have some pate at Thanksgiving! I’ve never had rillettes before, so I would love to try these products. I would like to serve them for a get together with my art group. I haven’t had good pate in a long, long time. This spread is making me drool! I LOVE having cocktail parties, especially during the upcoming holidays, so I know these Alexian products would be perfect to serve to guests! Love the examples of how to serve them, too! Tis the season! I’m so inspired to serve a spread like this! This tutorial was awesome, love those delicious platters! 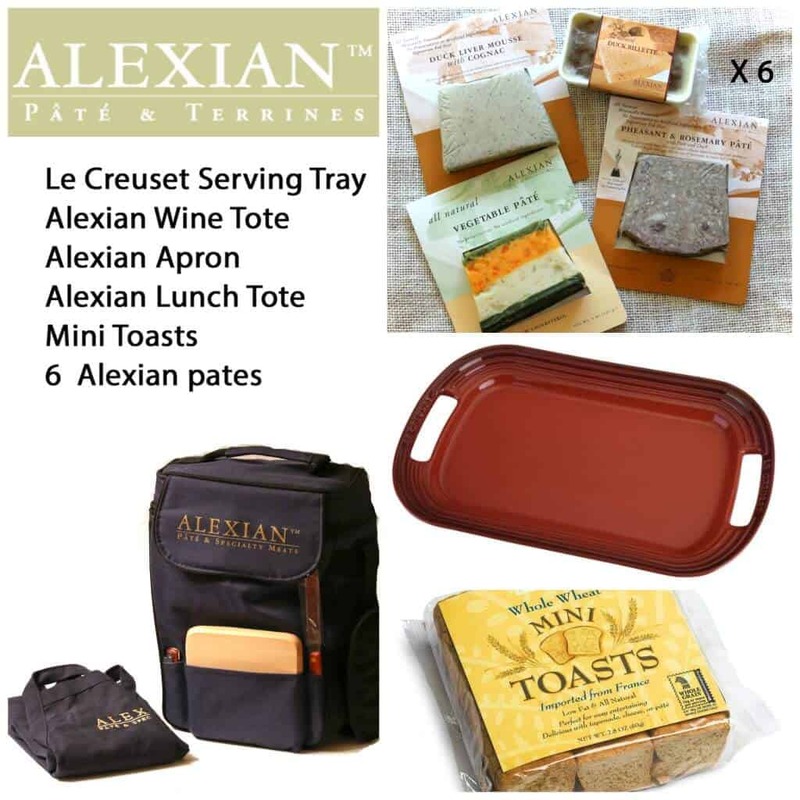 I would love to try these Alexian products and serve them at my next dinner party. Wonderful article and great photography! I could almost taste it by simply looking at the photos. Used to be (always kids of course)cars, hockey, golf and food – as I get older it is pretty much cars & food – HaHa! – I love receiving your emails, always interested in the wonderful creations – Thank you! Memorial Day, Remembrance Day here in Canada – thinking more about that but I still have to make dinner! I love French cuisine and would love to try these out. They would be great for the next time we have friends over! I am just now learning to cook (and I have been an adult for a while! ), and it is so exciting to try making new things. I had never even heard of some of the foods you mentioned, and now I am looking forward to trying! We are hosting our first dinner party in a few months, I think that would be a perfect time. What an absolutely wonderful article. Thank you, Kimberly and Sandrine. I’m going to check out Alexian (another great story) and do some serious ordering and plan a Fall afternoon fete pretending that we’re sitting at a table at l’Ecluse in Paris sipping a 1er Cru sauterne and your creations above! Until then, I will make Sandrine’s Maple Carmelized Onions tomorrow with a brie log wrapped in puff pastry, the maple onions, served with lingonberry sauce and baguette toasts.